”Sorry, we don’t do vans,” I’ve been telling people. Rather too frequently. So we thought we’d better start. 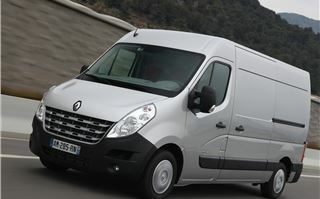 The new Renault Master, available from May 2010, is Renault’s big white van. 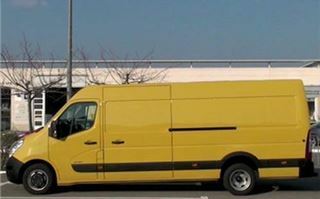 Or, in our case, big yellow van. It comes in lengths of 5,048mm, 5,548mm, 6,198mm with front wheel drive. And 6,198mm and 6,848mm with rear wheel drive. 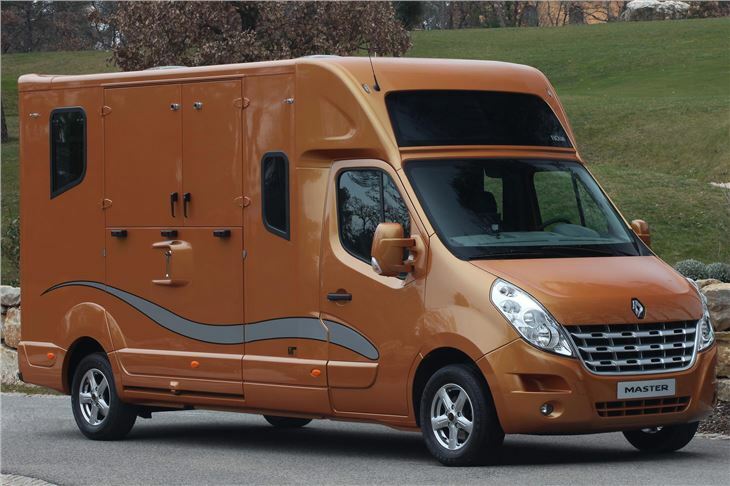 All are the same width of 2,070mm, or 2,470mm including the essential huge door mirrors. Heights are from 2,303mm to 2,749mm with front wheel drive and 2,549mm to 2,815mm with rear wheel drive. 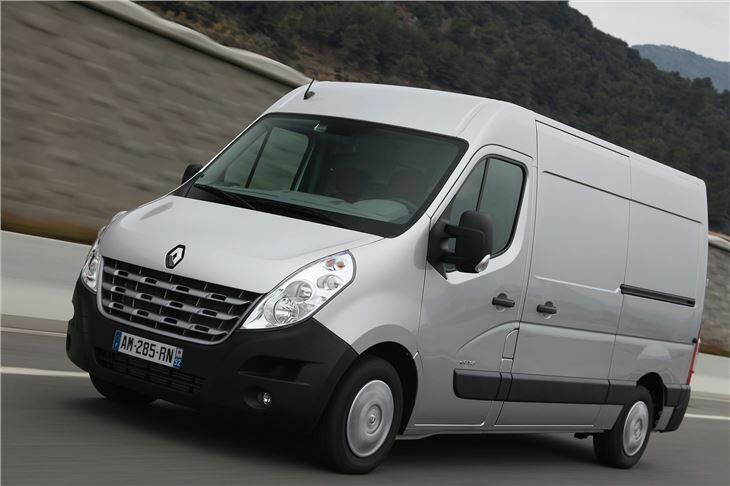 Capacities are from 8 cubic metres to 14.8 cubic metres front wheel drive and from 12.4 cubic metres to 17 cubic metres rear wheel drive. Or as much as 22 cubic metres with a Luton style box body. 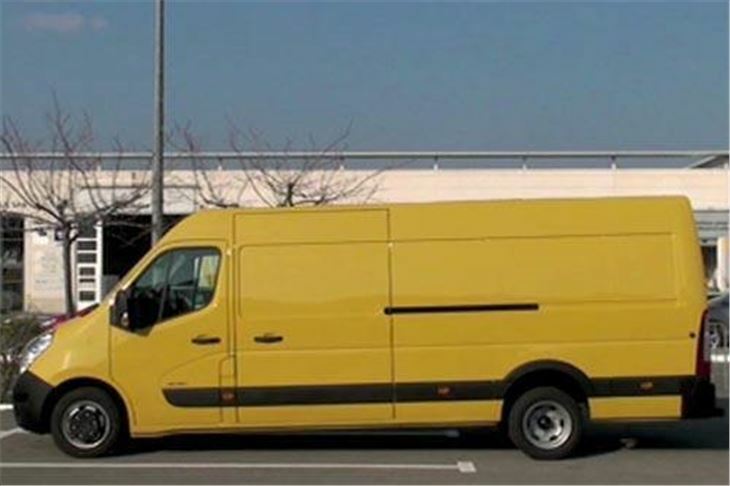 So that last one is quite a big van. 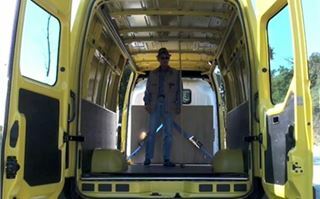 Maximum payloads get complicated, though obviously if you need to carry really heavy loads you will need the rear wheel drive 3.5 tonne and 4.5 tonne chassis. Engines are the same basic new 2,298cc 4 cylinder diesel with outputs of 100PS, 125PS or 150PS and torque of 285Nm, 310Nm and 350Nm. You can get the dCi 100 and dCi 125 as EU4, all as EU5 with a manual 6 speed transmissions and the 125 and 150 with robotised autoclutch 6 speed transmissions. Two different rear axle ratios are offered on the RWD chassis. 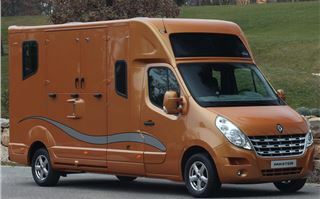 You can also decide whether you want twin sliding side doors, single sliding side door or no side doors aft of the cab. 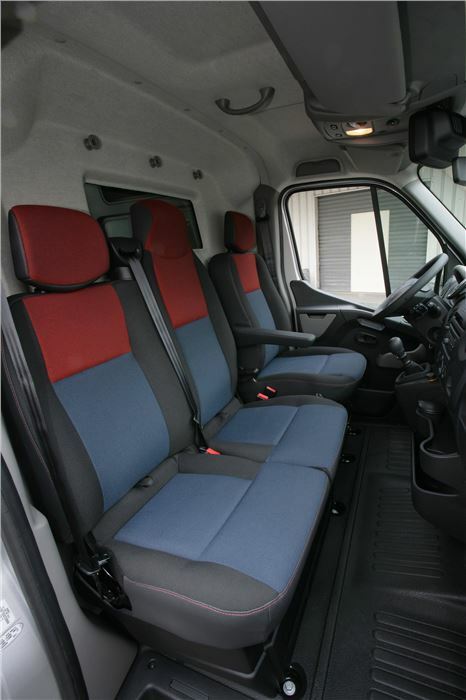 You can have a crew van version with rear seats. You can order bus versions. You can order chassis/cabs. You can have pick-ups and tippers. Most Masters are built to order according to the spec the customer needs. And obviously fuel economy and performance will depend on the spec, the weights carried and the sort of work the vehicle is put to. 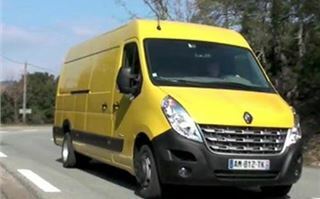 Combined fuel economy is 33mpg at best, and CO2 187g/km upwards, but pointless including all the specs in a road test when you can access them at (Renault vans URL). 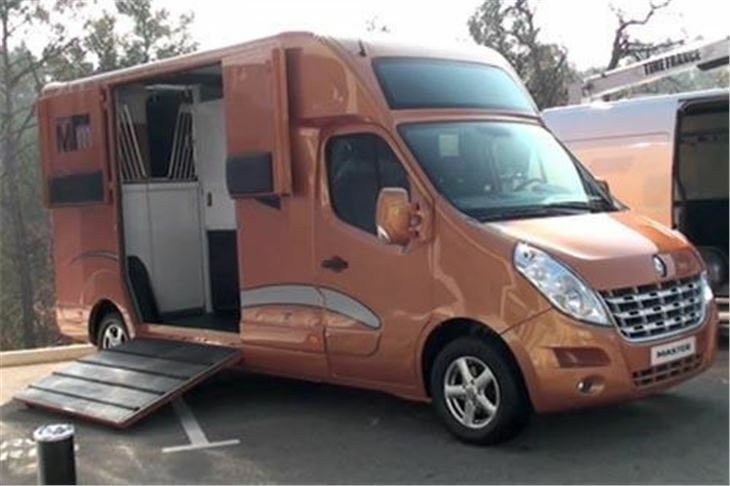 Renault approved coachbuilders offer a variety of vehicles based on the Master front wheel drive or rear wheel drive chassis, including horseboxes, ambulances, cherry picker vans, buses, vehicles adapted for carrying the disabled, refrigerated vans, you name it. 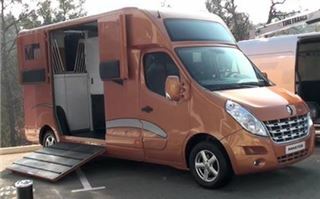 Towing capacity is up to 3 tonnes. In the UK all are covered by a 3 year 100,000 mile warranty. 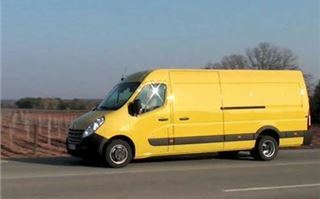 We first drove a 6,848mm standard roof rear wheel drive 3.5 tonne version with a loadspace of 14.9 metres. The engine was the 150PS version of the 2.3 chain cam diesel with a 6 speed manual transmission. CO2 was certified at 249g/km and fuel economy at 9.4 litres per 100km. Stepping inside the cab was quite a surprise. 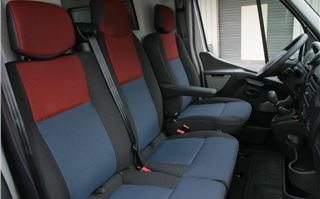 The centre passenger seatback folds down to become a table with cupholders and a swivel top for operating a laptop computer from the driver’s seat. A clipbard springs out neatly from the dash. There are dashtop storage compartments. Carminat TomTom remote control satnav with an overhead screen. Cruise control with a speed limiter. 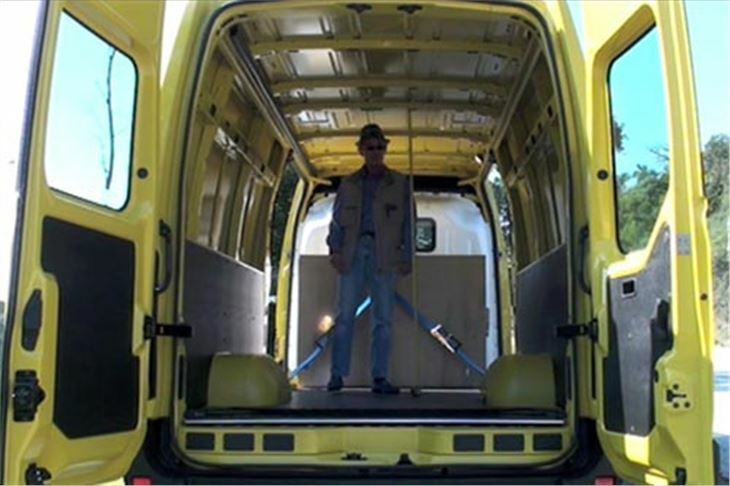 Options include a suspended driver’s seat capable of taking weights from 50kg to 130kg. Cornering lights are available. 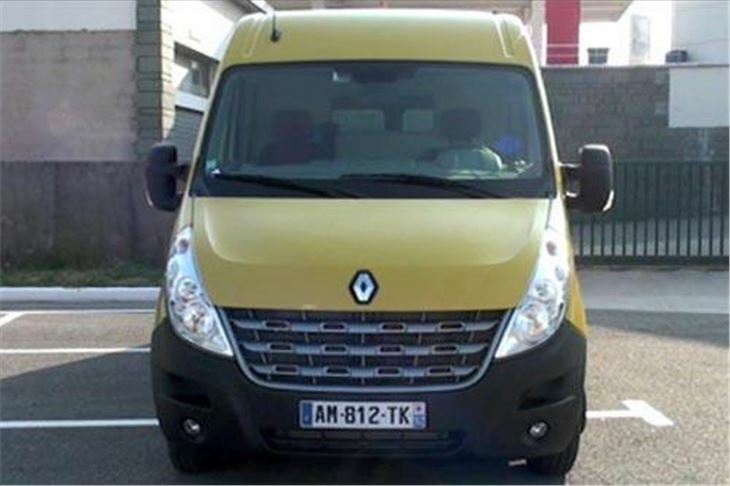 The option of a Renault Keycard is extremely helpful for drivers making deliveries not having to worry about locking and unlocking the van. You can even specify a reversing camera with screen in the back of the driver’s sunvisor. For such a big vehicle it was surprisingly light and easy to handle. And very rugged. Part of the route was up an unmade road over a hill, which the twin rear wheels took in their stride. 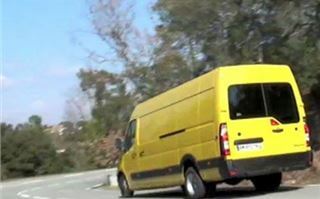 Later we drove a 6,198mm 125PS front drive version of the van that seemed to have a bit more ‘bite’ at the front end but otherwise drove in a very similar manner. 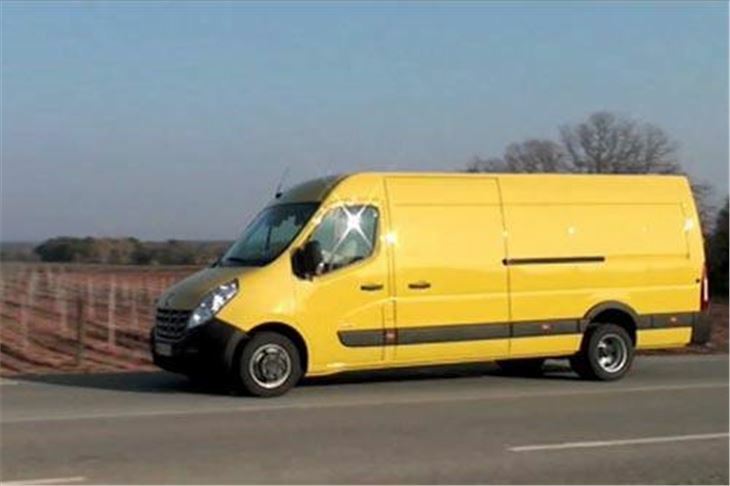 Master prices start at £20,795 for a front wheel drive 100PS Freeway van with a load volume of 10.3 cubic metres and a payload of 1,415kg. They rise to £27,245 for the rear wheel drive 150PS MML35TW that features in our test and £29,945 for the crew van version. All prices plus VAT at 17.5%, of course. 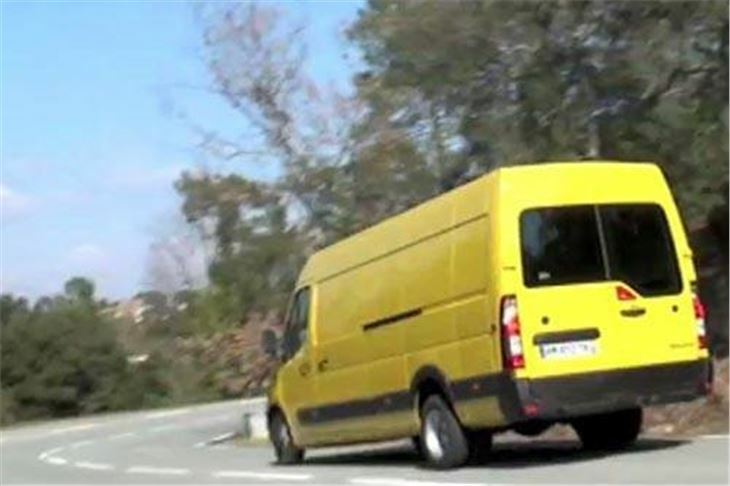 By March 2010, Renault had 14.8% of the total EU market for light commercial vehicles, compared with 11.8% for Citroen and 11.6% for FIAT, and sold a total of 206,000 LCVs in 2009. 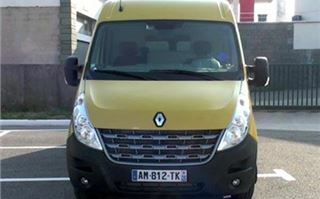 It now offers 400 ‘one stop shop’ Renault Pro+ LCV dealerships throughout Europe. 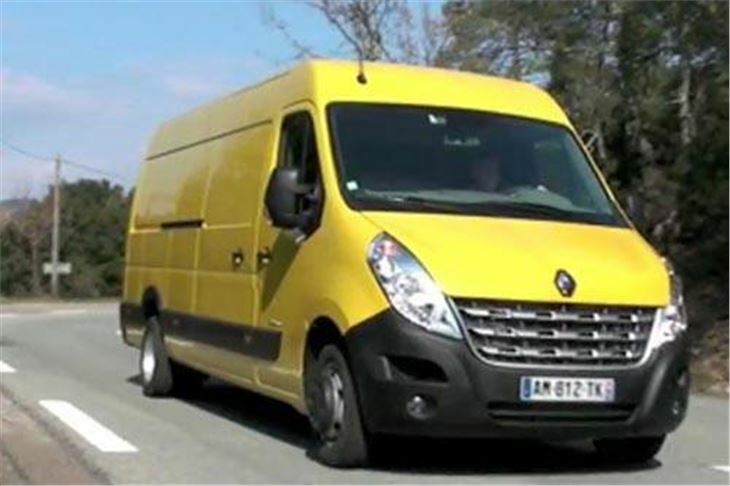 All Renault vans carry a 3 year, 100,000 mile warranty in the UK.